This is my first website, I started off with graph paper mapping out the main structure of the webpages which I used as a base for the graphic of the pages I did in Adobe Photoshop. I used the measurements in Photoshop as rough guide to what differing scales I would use in my coding. I then added the blog entries and downloaded pictures and finally I uploaded the blog onto the GHIS website. 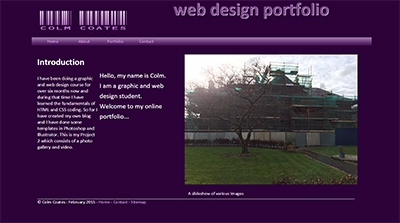 This is my second website, It is similar to the project one blog but more complicated as it is a portfolio website. as before I started off with graph paper mapping out the main structure of the webpages which I used as a base for the graphic of the pages I did in Adobe Photoshop. I used the measurements in Photoshop as rough guide to what differing scales I would use in my coding. 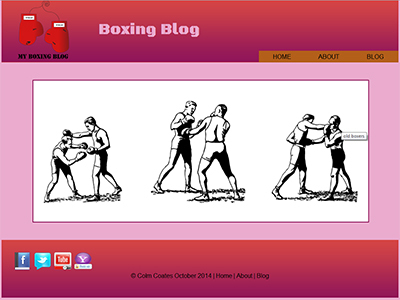 I then added the blog entries and downloaded pictures and finally I uploaded the blog onto the GHIS website. This was my work experience assignment which I did for my work preparation class. 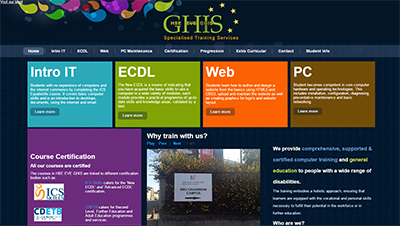 The work experience was actually for GHIS itself, to do web design work on the new GHIS website. Because of this I took instruction from my web design teacher. I used Wordpress to edit the code for the website and add content. The website itself had the structure, header, and content boxes already. 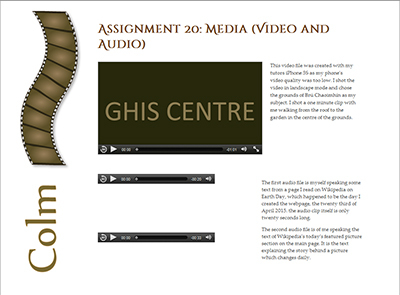 My job was to create the links to the different websites from the GHIS site. I also added text describing the different courses available and general information about the centre. I finally created some new tables showing the different certifications and modules. When I needed to add or change CSS, I had to use embedded CSS to override the existing CSS because manually changing the CSS in the multiple style sheets would've been inefficient. This is my blog which I created in Wordpress. I created a logo inspired from my project 1 to add a personal touch and installed a theme called superhero. 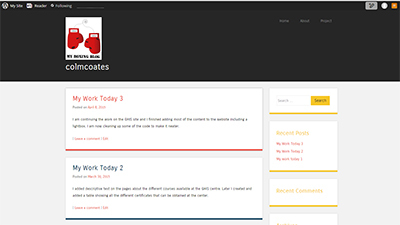 I have so far added posts on my work for the centre and no more as I am not a social diary person. This is a webpage I made to create video and audio files. I created a film strip logo in Adobe Illustrator to add good aesthetic. I shot a video of the centre grounds and narrated Wikipedia page segments for the audio files.